林憶蓮段是不是後勁不"繼"?梅艷芳段,古文並無"強差人意"這句語, 但有句"差強人意",好似係出自後漢書, 但不表示成績差, 而係尚可, 可接受. 若你想講成績差, 不如說成績"未如理想","麻麻"之類. 以前有個飲品廣告用錯"強差人意", 結果被封殺. How so? None of 林憶蓮, 劉美君, 梅艷芳(Rest in peace), 葉蒨文, 林志美, 葉德嫻, 徐小鳳, 杜麗莎, 甄妮 are exactly packing the stadium or even releasing music regularly anymore. 甄楚倩 has long since drifted into obscurity even. I am not a particularly big fan of Priscilla but I think after more than 20 years in the business and still has however small following isn't doing too poorly. 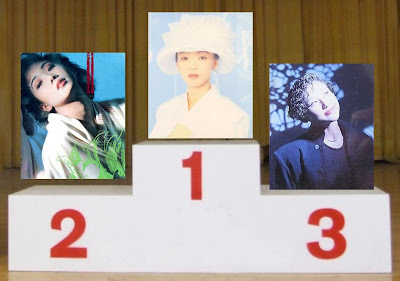 If 最霉 because of her mental health, well try to compare that with Anita Mui.